After the overwhelming success of shows such as Puella Magi Madoka Magica and Fate/Zero, it's no surprise that writer Gen Urobuchi is a hot topic in the world of anime. Despite only being responsible for a handful of episodes and the overall concept, having his name attached to Gargantia on the Verdurous Planet (Suisei no Gargantia) has no doubt brought it to people's attention. 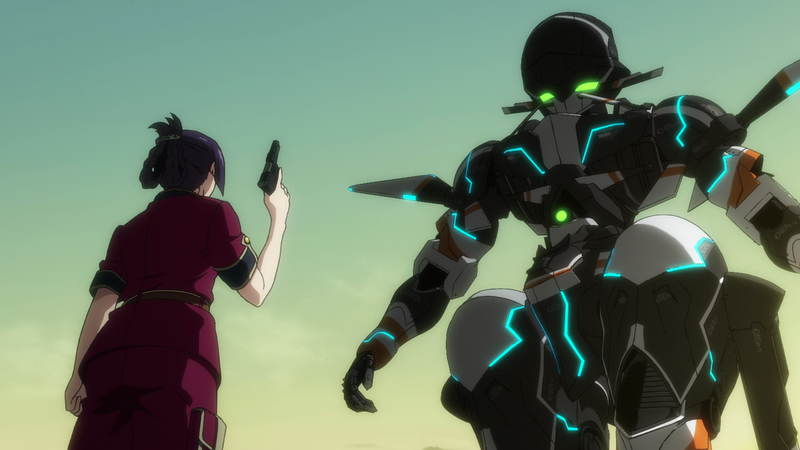 A 13-episode series from the studio Production I.G., Gargantia first aired in 2013 and has since spanned a further two OVAs - with a two-part OVA sequel also set for release later this year. In the distant future mankind has abandoned the dying planet Earth, taking to the stars and forming the Galactic Alliance of Mankind. They've also become embroiled in a war against a tentacled alien species known as the Hideauze, with the Alliance's soldiers raised to be entirely dedicated to the never ending conflict. 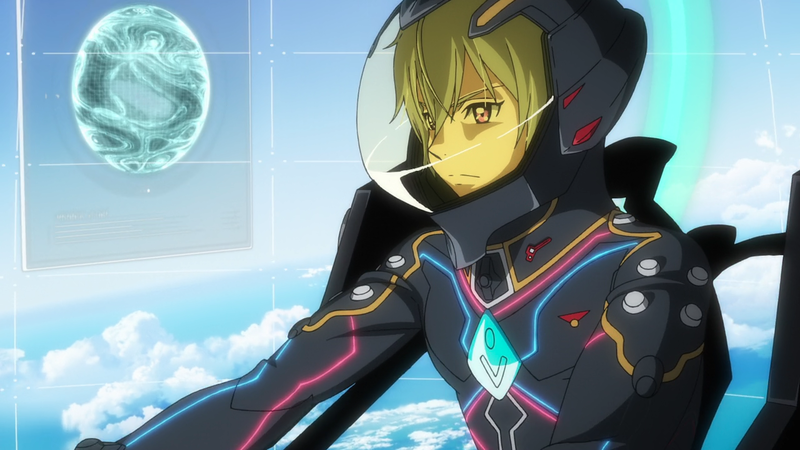 Sixteen year-old Ledo is such soldier, piloting a high tech robot known as a Machine Caliber. In a battle against the Hideauze, Ledo loses consciousness and is knocked into a nearby wormhole. Awakening on a strange planet cut off from the Galactic Alliance, Ledo learns from his Machine Caliber's AI 'Chamber' that he has been in stasis for six months. Both he and Chamber have been picked up by a ragtag group of humanoid scavengers, and after a heated first encounter Ledo discovers the Earth isn't quite as dead as he thought it was. Following a fifth ice age, the planet has become covered in water and the last remnants of humanity survive on huge fleets of ships. Ledo has been picked up the largest of these fleets - the Gargantia. As Ledo befriends a young delivery girl named Amy, he learns more about the Earth and all the things he's never known during his life as a soldier. But when what he believes to be the Hideauze appear from the ocean depths, Ledo makes a discovery that changes his life forever. An advanced human landing on a primitive planet and learning to appreciate their way of life is hardly an original concept, nor is it one that's exactly been away from the spotlight in recent years. But despite the heart of Gargantia being a glorified Waterworld meets Avatar/Ferngully/Dances with Wolves/etc., its concept is undoubtedly an interesting one to explore in the imaginative worlds anime can provide. And for the world that's entirely covered in water, Gargantia provides some really beautiful scenery. What we have are floating cities travelling on sparkling waters, and rusty whites, browns and oranges float boldly on a never ending ocean of deep green. What seem like a mish-mash of structures on the outside are actually a claustrophobic community which oozes personality just from the way it looks. With all these bright colours surrounding them, its no wonder that the people of the Gargantia seem so happy despite the obvious hardships they face. But what initially sucked me into the world of Gargantia was how the language barrier between Ledo and everyone else was handled. Not only did the show display two different-sounding languages exchanged between the two parties, but Ledo's understanding of the Earthian language is a slow-burning process. Slowly but surely we see him grasp more and more of the language, with Chamber continually acting as a translator where appropriate. Poor explanations of language barriers is a problem I find with a lot of science fiction and fantasy, so to see a series tackle it head on proper consideration is something I can really get behind. This slow burning process also relates to the growth of Ledo himself, and helps him get out what could of easily been the rut of a cookie-cutter protagonist. Rather than him going from a soldier than lived and breathed his mission to a man with a new lease on life, he slowly undergoes the change and a little bit of his tough exterior is chipped away each episode. Even though its still a shocking reveal which makes him rethink everything he's ever fought for, the effect living on Gargantia is making its impact way before then. This is partially thanks to the inclusion of Amy, whose relatively carefree nature is the exact opposite of Ledo. She rubs off on him, and in turn a little bit of him rubs off on her as well. There will be fan service. Amy and Ledo might make the perfect pair, but if anything its actually Chamber that proves to be the most loveable character of the bunch. Even though he's an artificial intelligence bound by logic, his close relationship with Ledo makes him a proper character in his own right. And as their relationship continues to develop on this strange new world, Chamber comes out as more than just a support system dedicated to the development of his pilot - he's a true friend through and through. CGI mecha amongst 2D characters and a 2D backdrop is something that continues to divide opinion among anime fans, and is something I'm not personally fully sold on yet either. 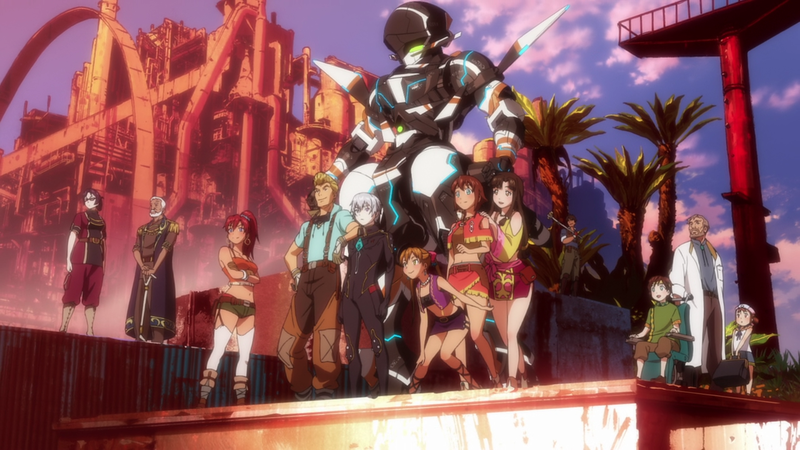 That said, the fact that Gargantia primarily only features one robot somehow makes it work. The use of modern technology to bring Chamber to life nicely parallels how much more advanced the machine is to everything else that's left on Earth, albeit unintentionally. Also making fleeting appearances in the show are the Earth-built mecha, which are known as 'Yuboro' in the show's mythos. 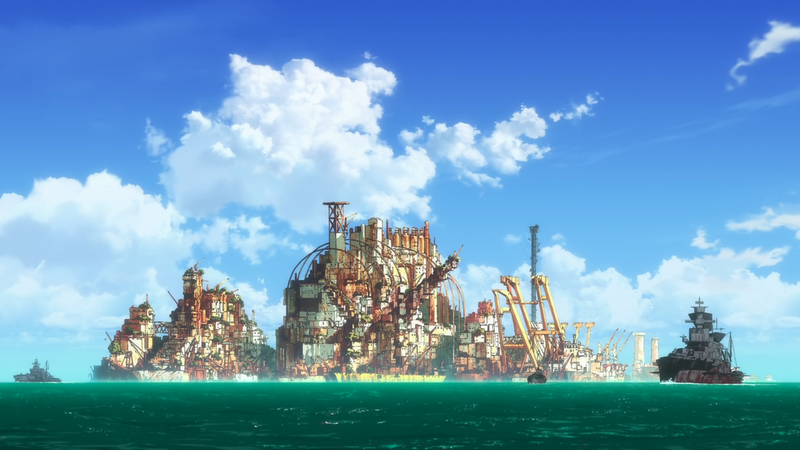 Though much simpler in design, there's something so much more endearing about these rusty nautical mecha. Chamber may come out on top by being an actual character, but in terms of badass robot action it's Pirate Queen Rakkage's Red Lobster Yunboro that steals the show. High-tech machinery is a dime a dozen in anime, so it's shame that the more unique looking machines don't get more of a spotlight. The problems with Gargantia depend on just how familiar you are with Gen Urobuchi's work. It can't be denied that the man is one of the best writer's in the modern anime industry - the world building he's able to do in a mere 12/13 episode series is incredible, but if you've watched more than one of his shows you'll begin to notice the same themes cropping up in all of them. And this wouldn't necessarily be a bad thing if it didn't mean all the shocking twists could be predicted a mile off. Admittedly Gargantia pulls off some pretty impressive twists in its run, but as far as twists go they are pretty by the book ones. On a more general note, character develop is also spread quite thinly. No one can deny that Gargantia is very much Ledo's story, and so by proxy is going to receive the majority of the development and growth. However the citizens of the Gargantia fleet have very little to offer outside of names and duties, lacking even more than you'd expect from a one-cour show. As plucky a love interest as Amy may be, she receives next to no backstory and is largely only a plot device for Ledo to discover his humanity. The same goes for her brother Bevel, and then names like Ridget and Bellows are only there to fill out the ranks of the crew/side characters. Pinion is the only enduring one of the bunch, a hot-headed scavenger that eventually breaks away from Gargantia in an effort to avenge his dead brother. 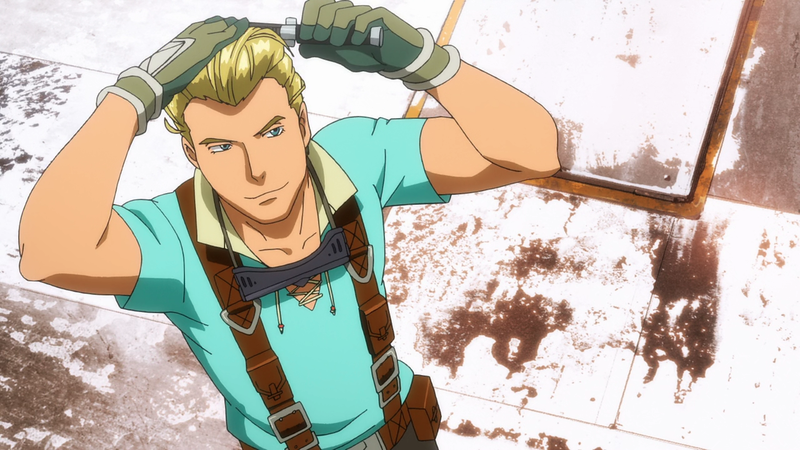 The lead up to Gargantia's finale help shed some light on Pinion as a character, but it comes as little too late and isn't helped by the fact that his new crew is made up of entirely fresh faces. 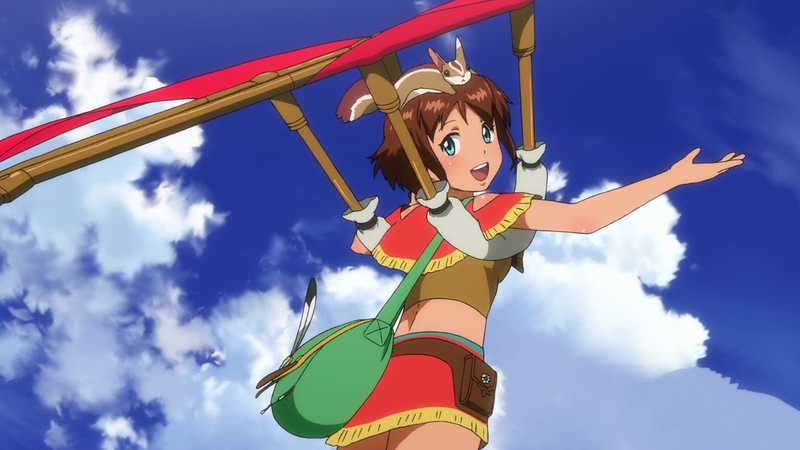 Gargantia on the Verdurous Planet is a show that could have certainly done with more episodes. Doubling its episode would have done wonders for the simplified story and lack of character development all-around. But not only that - an extended running time would also have satisfied the need for more. Even with its flaws, Gargantia is a beautiful series that really makes the most of its setting - building a memorable world that just begs for more stories. It certainly isn't the most cerebral of Gen Urobuchi's works, but it's certainly one of the least bleak and, more importantly, the most captivating.